Article is an excerpt from previously released Sidoxia Capital Management’s complementary July 2012 newsletter. Subscribe on right side of page. I love pizza, and most fellow connoisseurs have difficulty refusing a hot, fresh slice of heaven too. Pizza is so universally appreciated that people consider pizza like ice cream – it’s good even when it’s bad (I agree). However, even the biggest, diehard pizza-lover will sheepishly admit their fondness for the flat and circular cheesy delight changes when you integrate anchovies into the mix. Not many people enjoy salty, slimy, marine creatures layered onto their doughy mozzarella and marinara pizza paradise. Doesn’t sound too appealing, does it? So, what are most investors doing in this unclear market? Rather than feasting on a pungent pie of anchovies, investors are flocking to the perceived safety of low yielding asset classes, no matter the price. In other words, the short-term warmth and comfort of CDs, money market, checking, and fixed income assets are being gobbled up like nicotine-laced pepperoni pizzas selling for $29.95/each + tax. 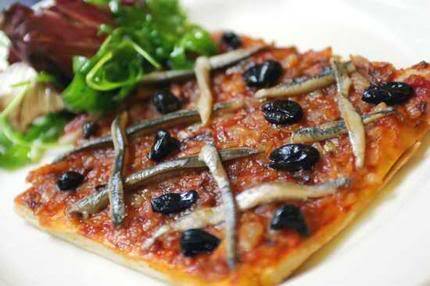 The anchovy alternative, like stocks, is much more attractively priced now. After accounting for dividends, earnings, and cash flows, the anchovy/stock option is currently offering a 2-for-1 special with breadsticks and a salad…quite the bargain! Nonetheless, the plain and expensive pepperoni/bond option remains the choice du jour and there are no immediate signs of a pepperoni hangover just quite yet. However, this risk aversion addiction cannot last forever. The bond gorging buffet has gone on relatively unabated for the last three decades, as you can see from the chart below. 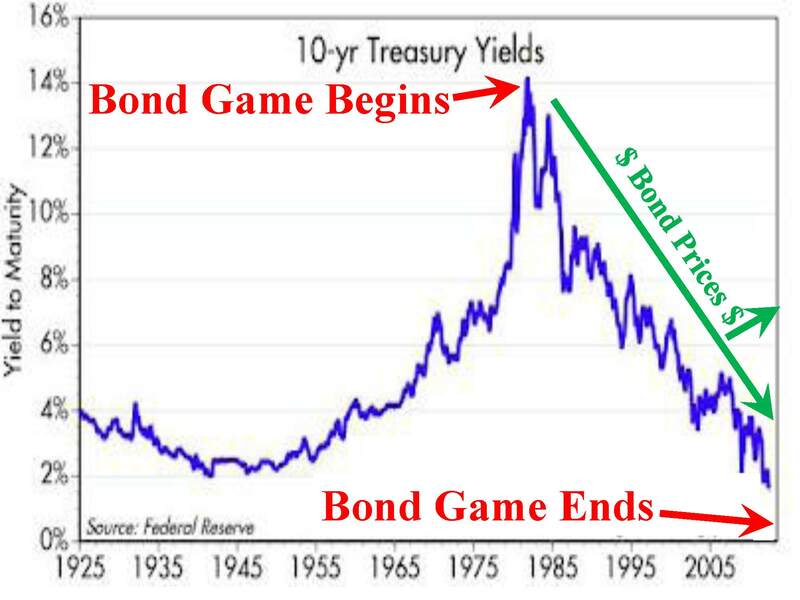 In spite of this, the bond binging game is quickly approaching a mathematical terminal end-game, as interest rates cannot logically go below zero. Since my firm (Sidoxia Capital Management) is based in Newport Beach, next to PIMCO’s global headquarters, we get to follow the progression of the bond binging game firsthand. I’ve personally learned that if I manage close to $2 trillion in assets under management, I too can construct a 23-story Taj Mahal-esque headquarters that overlooks the Pacific Ocean from a stones-throw away. 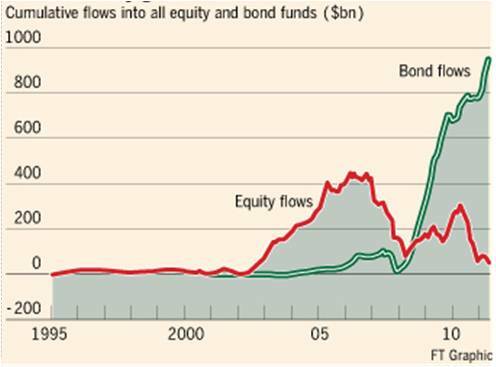 Source (The Financial Times): Bond purchases have exploded in the last three years. 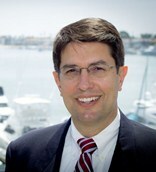 Source (Calafia Beach Pundit): Stuffing money under the mattress has accelerated in recent years as fear, uncertainty, and doubt have reigned supreme. 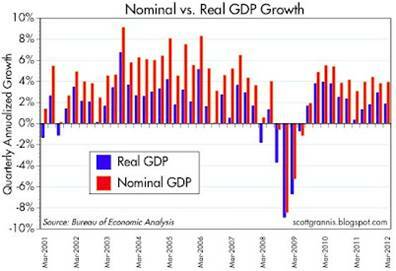 1) Growth Rolls On: Despite the aforementioned challenges occurring domestically and abroad, growth has continued unabated for 11 consecutive quarters, albeit at a rate less than desired. We are not immune to global recessionary forces, but regardless of European forces, the U.S. has been resilient in its expansion. 2) Jobs and Housing on the Upswing: Unemployment remains high, but our country has experienced 27 consecutive months of private creation, leading to more than 4 million new jobs being added to our workforce. 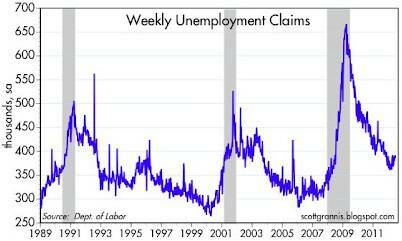 As you can see from the clear longer-term downward trend in unemployment claims, we are moving in the right direction. 3) Eurozone Slowly Healing its Wounds: The Greek political and fiscal soap opera is grabbing all the headlines, but quietly in the background there are signs that the eurozone is slowly healing the wounds of the financial crisis. 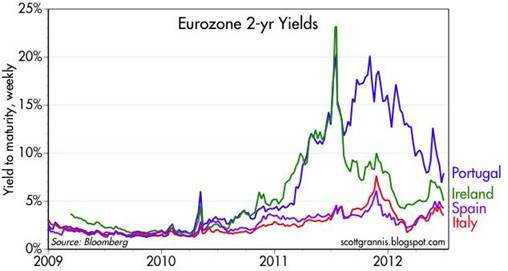 If you look at the 2-year borrowing costs of Europe’s troubled countries (ex-Greece), there is an unambiguous and beneficial decline. There is no doubt that Spain and Italy play a larger role than Portugal and Ireland, but at least some seeds of change have been planted for optimism. 4) Record Corporate Profits: Investors are not the only people reading uncertain newspaper headlines and watching CNBC business television. CEOs are reading the same gloomy sensationalistic stories, and as a result, corporations have been cautious about dipping their short arms into their deep pockets. Significant expense reductions and a reluctance to hire have led to record profits and cash hoards. 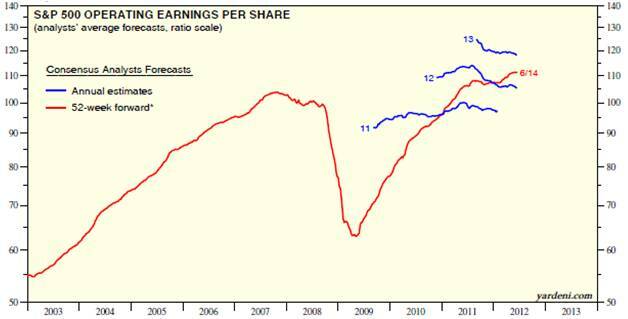 As evidenced by the chart below, profits continue to rise, and these earnings are being applied to shareholder friendly uses like dividends, share buybacks, and accretive acquisitions. 5) Attractive Valuations (Pricing): We have already explored the lofty prices surrounding bonds and $30 pepperoni pizzas, but counter-intuitively, stock prices are trading at a discount to historical norms, despite record low interest rates. 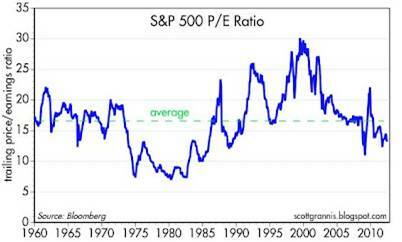 All else equal, an investor should pay higher prices for stocks when interest rates are at a record low (and vice versa), but currently we are seeing the opposite dynamic occur. 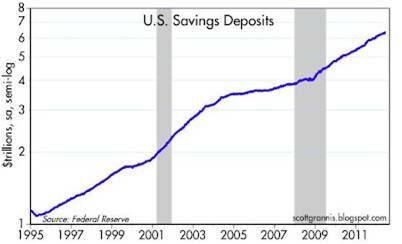 Investing has never been more difficult with record low interest rates, and it has also never been more important. Excluding a small minority of late retirees and wealthy individuals, efficiently investing your retirement dollars has become even more critical. The safety nets of Social Security and Medicare are likely to be crippled, which will require better and more prudent investing by individuals. Inflation relating to food, energy, healthcare, gasoline, and entertainment is dramatically eroding peoples’ nest eggs. Digesting a pepperoni pizza may sound like the most popular and best option given the gloomy headlines and uncertain outlook, but if you do not want financial heartburn you may consider alternative choices. Like the healthier and less loved anchovy pizza, a more attractively valued strategy based on a broadly diversified portfolio across asset class, size, geography, and style may be the best financial choice to satiate your long-term financial goals. Entry filed under: Financial Markets, International, Themes - Trends. Tags: bonds, china, debt, deficits, eurozone, fiscal cliff, GDP, Greece, healthcare, investing, Italy, Spain, Stocks, unemployment, valuations.